Expert Wheel Alignment in Bellevue! Your wheel alignment is important for you and your car for many reasons. Proper wheel alignment is essential to ensure that your car's tires wear correctly. More importantly, it's a matter of driver safety. Bad wheel alignment can limit a driver's ability to have control over the vehicle. Correct wheel alignment is good for control and also very good for your overall fuel efficiency. You really should try to get your vehicle's wheel alignment inspected every six months or at least every year. We've been handling Wheel Alignment Bellevue drivers can depend upon for their utmost safety and efficiency. There are many ways that your car may be knocked out of alignment. Your vehicle's suspension could wear and the springs may be stretched. Running into the curb or a small collision can throw off your suspension and make your car misaligned. We obtain alignment readings that will let us know precisely what needs fixing concerning the caster, camber or toe angle. This can be corrected quickly through a re-alignment that will make sure that your suspension components are restored to their proper measurements so that your car will drive straight and your wheels are sitting in the correct positions. While we are fixing your car Ali's Bellevue Auto Repair will also inspect your tire pressure, and ware through professional testing. Ali's is also equipped to work on large vehicles and commercial trucks. We are proud to also work on engines, transmissions, auto body and everything else you may need for your car. We are a family-operated shop, with great hours and we also offer a free local shuttle service. With quick, affordable service we will get you back on the road! 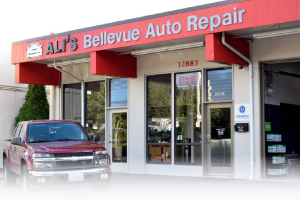 Our Bellevue Location is Easy to Find! Call 425-450-9713 or Use the Form Below and We'll Respond Shortly! Keep up with Ali's on Facebook.